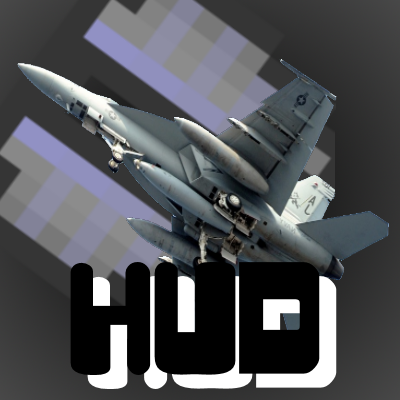 "Hmm, I wonder how it'd look if you had fighter jet HUDs.."
Neither did I! Til I did! This mod follows the SHCM Mods Guidelines. Yes of course, Although will all the school I have currently, Dont expect it to be updated as much.. I also need to add modpack thing to the guidelines.. tnx! Hello possible to the altitude bar to display a bar of the height under ceiling ? Looks nice, also better make small navigation section in ROSE mode and move airspeed and altitude (as columns) to sides. In the future, You'd have more options of displaying the HUD, What do you mean in "ROSE mode"? Uhm, sorry, this is heading indicator, that's more correct. I'll suggest switching compass (upper) and this heading indicator (lower) in settings. Hmm.. Seems interesting.. But one problem is the thing being round.. Minecraft rendering is pretty crappy and I'll probably need to do some weird OpenGL stuff..